The sleep struggle. It's so real. The desire to keep your kids in bed at night, to keep them down for nap as long as you'd like, and to keep them asleep as long as you'd like in the morning, is a common struggle I hear from moms, and one we have dealt with four times! We are sticklers for bedtimes and not waking too early in the morning. I've been called a drill sergeant when it comes to my kids and napping. If by, I want my kids to nap so they don't go completely crazy by dinner time, and, as a stay home mom to four kids only four and a half years apart in age, I need the two hour down time for my sanity, then yes, I have been a complete drill sergeant about naps and would be so all over again. My older two still 'rest' on occasion and my youngest son still naps about 40% of the time, but we have a daily quiet time while their little sister has her nap. It helps keep my sanity in check as a homeschool mom with my kiddos all the live long day. But....all of our kids have gone through phases of not wanting to nap anymore about age three to four which, by stories from other moms, I gather is very common. Most moms I've talked to quit putting their kids down at this age. To each her own, but I have pushed through (with help from our secret weapon) with every kid and found that they all, after a few weeks, will easily fall back into the rhythm of napping. 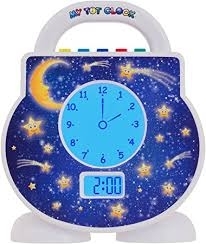 Along with extreme consistency, I'd like to share the secret weapon we found that worked wonders for our three boys and is currently still encouraging our daughter to keep her head on the pillow.... the Tot Clock. Our oldest son, when he was almost three (he's nine now), would wake up between 3-3:30 am eyes wide, ready to conquer the day. Now mind you, I was about seven months pregnant and his little brother was about 15 months old during this time, so we were never "eyes wide, ready to conquer anything" during this season, especially not at 3am!! We guided, pleaded, demanded, rewarded, but nothing would keep him in the bed once he stirred during those wee hours. It went on for weeks when we finally had the brilliant idea to look for a clock that might give him a visual for when it's acceptable to wake up. We found several clocks but one included options for music or bedtime stories, and on top of bedtime, offered nap, time-out, and 'encouragement' options. We made the purchase of our first Tot Clock and waited sleepily for it's arrival, hoping it would offer a solution that would keep our son in bed! Guys, I'm telling you, I have told every mother of a toddler and many new moms, GET ONE OF THESE! It was an amazing visual that even a wide eyed toddler could take one glance at and know he needed to turn over and go back to sleep. It worked immediately and we regained our sleep. With each feature you set the desired time and it turns blue at that time, yellow at the designated awake time, each with an option for music. For nap, you set your duration and ta-da, no more, "Is my nap over? ", "When can I get up?" The answer is easy....is your clock yellow? If not, get back in there. People, it's genius and one of the best purchases we've made for our kids. They are the best sleepers, rarely wake early, and when they do they know they have to stay in bed quiet until the allowed time. The time-out feature is great when there's temptation to leave them in their room for hours because you're so steaming mad. With the clock, you set an age appropriate time and the clock turns red. When it's yellow, time-out is over. Same with the encouragement feature which we use for room clean up, or quiet reading time for the younger ones who aren't telling time yet. Currently, our daughter is the one pushing the limits on sleep waking up about one to two hours before I'm ready to start the day, and before her clock turns yellow. But I know the key is to keep turning her around back to bed, and in no time, like her brothers, she will learn that when the clock is blue, she stays in bed getting the rest her pretty little head needs, and allowing me my much needed early morning coffee and Bible time to prepare for our day! If you've got littles, you need this in your life! Promise. You won't regret it! Be blessed and regain peace from the sleep struggle.